Dr. Jenny Oakes Sobera, biomedical sciences ’94, is a dermatologist and founder of Village Dermatology in Mountain Brook. She recently returned to Auburn to speak to COSAM’s chapter of the national pre-med honor society, Alpha Epsilon Delta (pictured left with AED Officer). 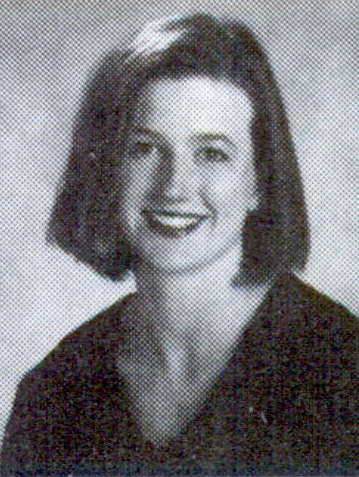 I started Auburn in fall 1990 after graduating from Mountain Brook High School in Birmingham. I grew up being an Auburn fan, and both of my parents attended Auburn. I knew that I wanted to go to medical school after college, and Auburn had a great reputation for pre-med. I joined a sorority (Alpha Omicron Pi), and this became an integral part of my college career. One of my favorite things about my time at Auburn was attending football games. Even as a pre-med student, I did not miss one home football game in four years! I always loved and excelled in math and science, so this major was perfect for me. I studied hard but embraced many of the fun parts of college. I think finding this balance while at Auburn has helped me throughout my life as a “Physician Mom.” My husband and I met during our sophomore year. He jokes that his GPA went up after we started dating because he had to go to the library to see me! How do you feel Auburn prepared you for medical school? After I graduated at Auburn, I went to the University of Alabama School of Medicine in Birmingham. My class had students from across the country, but I never felt less prepared than any of my classmates. In fact, I felt that some of my medical school classes were similar to my college classes. Don’t get me wrong, medical school is tough, but Auburn more than prepared me for those medical school years. Describe the highlights of your life and career after Auburn. I married my husband, Scott, during med school, and I had my first child, Will, after my third year. Will is attending Auburn as a freshman this fall, and I couldn’t be more thrilled that Will chose Auburn. I completed a dermatology residency program at UAB after med school. After practicing in Fairhope for two years, we moved back to Birmingham. By this time, we had three children, so being close to family was important. I started Village Dermatology in August 2008. We had our fourth child in 2011. Village Dermatology has grown from one dermatologist (me) and four employees to five dermatologists and a staff of more than 40. We are about to celebrate our 9th anniversary, and I feel blessed beyond measure. I have the privilege to work with the most amazing women everyday. We do medical, surgical and cosmetic dermatology. One of my favorite parts of my career is the variety. I get to see a child with eczema and then walk in to a surgery and excise a skin cancer. After that, I may have a laser or Botox patient. My day is never the same as the one before. I also really enjoy running the practice. I have some incredible managers like our practice administrator, Audrey Easterwood, who is also an Auburn graduate. I have learned that the level of success one has as a business owner is directly associated to the people you have in leadership roles. What advice would you give to a current COSAM student? I don’t have to say ‘study hard’ because they all know that. I would challenge COSAM students to ENJOY AUBURN! I still look back on these years as some of the best of my life. I studied hard and made good grades, but most of my memories are not about staying up late and stressing over tests and papers. My best memories are from football games and going out with friends and dating my future husband. Learning how to have a balance is key, so start now! I would also suggest getting some experience in a medical office or hospital. I worked at East Alabama Medical Center doing ECGs from 11 p.m. to 7 a.m., and had some other medical jobs. These experiences were important in confirming that I belong in medicine. They were also great on my resume and as a topic of conversation in interviews. One last thing: embrace a gap year. I did! Whether it is voluntary or necessary, this can be a great time to regroup and refocus. You will either realize you should take another path, or you will be convinced more than ever that you belong in medicine. Either of these is a great thing to know.